What a year for gardeners in Western North Carolina. A cool spring with late frosts in May delayed planting; heavy summer rains barely let up for even a day so leaves on our plants could never dry out; late blight and other diseases persisted in the wet weather; an early winter with mid-October freezes ended summer crop harvests earlier than usual; and scurrying animals—probably preparing for the early winter—gnawed on fall crops that they usually pass up for more enticing clover outside of the garden. 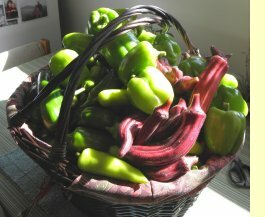 Yet, even with all the challenges, I was overcome by the bounty from the garden. As you can see from these photos of the M R Gardens 2013 harvest, I was in no short supply of blueberries, peppers, eggplant, tomatillos, squash, cucumbers, greens, beets, turnips, parsnips, carrots, cabbage and even Mountain Magic tomatoes (a blight resistant variety). I froze the tomatoes whole, packing my freezer full with several gallon-sized bags, and am still unthawing them bit-by-bit to add them to soups and stir-fries. 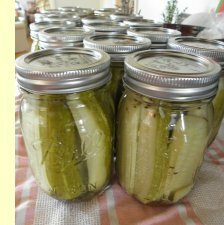 I canned 20 pints of cucumbers, using up a 2-week harvest from just two plants. I put up enough tomatillo salsa jars to give away for Christmas gifts and still have enough for my kitchen to last through next summer. I made several batches of green tomato chutney so I could perfect the recipe, a new favorite addition to my plate. My garden coach clients whom I taught the no-till method had just as much success as I did. This year reminded me of one of the many advantages of the beds I build: heavy rains can soak deep into the loose, uncompacted soil so that it doesn't overload the plants with water. The layers of organic matter that we spread months before the start of the season decompose to form a rich, fertile bed, which we simply loosen with a fork rather than till. Beds that I have maintained in this manner for several years are now an intact ecosystem of beneficial microbes that work in synergy to control disease. This year also reminded me how important it is for more of us to t ake part in the growing of our own food, even if it's just a small amount. Large-scale farms aren't easy to run the years that weather is uncooperative, which seem to be the norm rather than the exception lately. Farms that have rows and rows of the same crop in large fields make machinery the only practical way to prep the beds, and healthy soil tilth becomes difficult to maintain, especially in wet years. 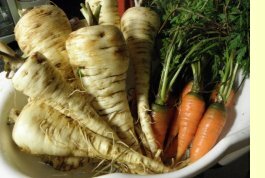 While gardeners can rejoice that one crop did well and not worry so much about the variety that did not, large-scale farm operators, especially if they're not diversified, do not have that luxury. One crop failure can mean an entire year's failure. The small-scale grower also has the luxury of chalking up uncooperative weather as learning lessons. Even though I am trying to make income from my gardening activities, I embrace the challenges. Every year since I started selling plants, Mother Nature has taught me something new. The first spring was super windy, the second was unusually hot, and the third was cool. Each year I needed to adjust my growing system to be able to work with what was given to me. I'd much rather be figuring this out when I'm selling 400 plants than when I'm selling 4,000. So I consider the challenges gifts. A lesson in the nursery becomes a good lesson in life—when life delivers harsh winds, simply adjust your sail. Who knows all that 2014 will bring, but I can just about guarantee that there will be challenges and it won't always be smooth sailing. But that won't stop me from gardening, as I hope it won't stop you. On the contrary, we can appreciate how the garden molds us into strong, tenacious people, capable of being flexible and nimble in even the harshest of winds. One of the reasons I started the Pre-Season Prep Service is so my customers can make special requests for varieties ahead of the season and rest assured their favorite flavors and colors will be in their gardens. I'll be ordering seeds in mid-January, so please let me know in the next month if you'd like to try out a particular kind of vegetable, herb or beneficial flower that I may not have offered in the past, and I'll give you an idea if I can grow it. It's also a good time to inform me which varieties you bought from me in 2013 were the most or least successful. In the early spring and fall, I typically grow arugula, broccoli, cabbage, collards, cilantro, kale, lettuce, leeks, mustard greens, parsley, spinach, Swiss chard, and totsoi. The summer vegetable seedlings I usually offer are: eggplant, peppers, pickling cucumbers, tomatoes, and tomatillos, along with a variety of herbs and beneficial flowers. While you're sitting around the Christmas tree, you might want to look through seed catalogs, such as Johnny's Selected Seeds, Sow True Seed and Southern Seed Exchange to see if any varieties of the above listed vegetables spark your interest. If they do, ask me about them! In 2014, I have plans to offer a few unique edible plants new to M R Gardens, so stay tuned for details. I've heard and read a lot of misinterpretation of terms associated with seeds, so I'm offering a very quick and easy explanation of the following: open-pollinated, heirloom, hybrid (also referred to as "F1"), certified Organic, Genetically Engineered and Genetically Modified Organism. If you grow open-pollinated (OP) varieties, you can save seeds for next year's garden and the plants' offspring will be very similar to the previous year's generation. If you try to save and sow seeds from your hybrid varieties, which tend to have special characteristics such as disease resistance, next year's plants will likely not have the exact same characteristics of its "parents," just like human children. Heirloom is a special name for an open-pollinated variety that has historical significance (it's usually at least 50 years old), particularly to a specific geographic region. Many food connoisseurs prefer the unique flavors of heirlooms over hybrids, and their interesting shapes, colors and textures add a richness to our lives and our plates. That said, in some cases, heirlooms can be harder to grow and less practical than hybrids, although that mainly pertains to large agricultural systems that require vegetables to be stored and shipped over long distances. I like Seed Savers Exchange's discussion of this topic. Organic seeds are ones that have been grown on farms certified under the USDA's National Organic Program, which prohibits the use of synthetic pesticides and fertilizers among other substances that present concern for optimal ecological health. The National Organic Program currently prohibits certified Organic farmers from using Genetically Engineered (GE) seeds, which are developed in high-tech labs and contain genes from organisms that the plant would never interbreed with in nature. Thankfully, GE seeds are currently unavailable for sale to home gardeners as far as I understand. GE seeds are typically sold to large-scale corn, soybean, sugar beet, cotton and alfalfa growers. The big confusion is the difference between the ways various groups define Genetically Modified Organism (GMO). I'll let you read for yourself the two varying definitions at these two sites, Home Garden Seed Association and the Master Gardener Extension program, but basically I've decided to avoid the term "GMO" so that it is not confused with "hybrid." If I refer to the type of seed that has many of my customers concerned for the sake of societal health, ecological systems and ethical business practices, I say "GE seed." Hybrids—such as tomato varieties bred for blight resistance, developed just down the road at the Mountain Horticultural Crops Research and Extension Center in Mills River—can have their benefits. I'm willing to give up a little of the rich taste of heirlooms if I can grow a plant without using organic disease and pest controls, as even these have small health and ecological concerns. (Or better yet, I'll plant both heirlooms and hybrids at the same time to guarantee a successful tomato year, which is often determined by forces we can't predict). My rule of thumb is to try out the OP and heirloom varieties first (and of course choose seed from growers who use Organic standards whenever possible), and if I don't have good luck with the OP seed, then I'll grow a hybrid the following year. Sometimes the issue is not with the variety itself, but with our growing techniques. Therefore, I will tweak my garden system (or perhaps buy the seed from another source) before entirely giving up on an OP variety. All of this experimentation takes time, and luckily gardeners have each other to swap stories and tips on the best performing varieties. One last complexity to the ethical dilemma— many organic growers have made a commendable attempt to not put any dollars into large seed companies with which they have strong ethical concerns. That means avoiding buying products that deliver any profits to these corporations, including the seeds that these companies hold the trademark names for—even some heirloom varieties. If I know that purchasing a particular seed variety will send even a small amount of money to companies in which many of my customers go to great lengths to avoid, then I will avoid buying that seed. Thankfully, there are hundreds and hundreds of seed choices out there, and new ones that are continually being developed for organic farmers that will replace the seeds that unethical companies now profit from. It's an ever-changing and very complex issue, but I do my best to keep up with the latest developments so I can be sure I'm serving my customers who want to make wise consumer choices. Trying out plant combinations at M R Gardens—varying yet complementary colors, textures, lines, patterns and sizes. ...and remember that I can help you design, set up and manage your garden. Read about my garden coaching and edible landscaping services.